It’s late May and we’re currently in the midst of the 2016 breeding season. Monitoring Little Owl nests is an annual highlight for me, and has been for nine years. It’s a privilege to see these beautiful and charismatic birds up close, and I immensely enjoy checking the same nests in different years. Each breeding season is different and it’s exciting to see how it unfolds. There are always a few surprises in store, such as large broods, new sites, finding unusual prey in nest boxes, and seeing a Barn Owl intruder in an active Little Owl nest! You can watch my incredible footage of this encounter here. Spotting Little Owl pairs near established breeding sites in March is always a good start. These can be new pairs, a repairing if one has died, or the same pair, as the Little Owl is generally a monogamous species. Little Owls usually start egg laying from mid-April onwards, and their laying dates can vary with winter and early spring weather; a prolonged cold or wet snap in late winter can delay breeding for some owls, whereas warm and dry weather can advance it. Timing of breeding can also vary with prey availability. Overall, Little Owls are more adaptable than Barn Owls, and will feed on the most abundant and accessible prey – this can include invertebrates, amphibians, reptiles, small mammals and birds. Their breeding outcome is less affected by peaks and troughs in Field Vole populations than Barn Owls. Female Little Owls lay on consecutive days, so there is approximately 48 hours between each egg, and the average clutch size is three or four eggs. 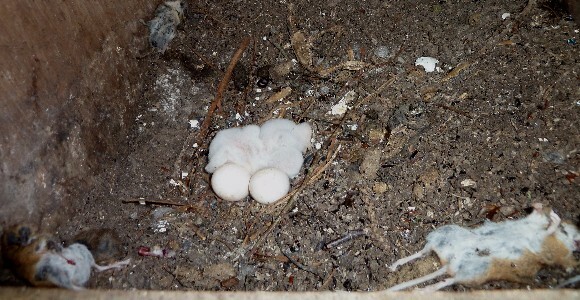 An unusually large clutch of seven eggs has been recorded in Wiltshire, Lancashire and Leicestershire. It’s always a treat to have a clutch of five or more eggs, especially if they all hatch, like this brood back in 2014. We usually carry out our first nest box checks at the end of April/early May, which is when most Little Owls are mid-way through laying or have laid their full clutch. During each box check, we keep a record of the time, date, location and box contents, including for non-target species such as Grey Squirrel, Stock Dove or Jackdaw. This information is collected for our long-term nest monitoring database and for the BTO’s nest record scheme. The Lewis Raptor Group has put up more than 100 Little Owl nest boxes across southern Wiltshire. They’re part of a long-term nest box project for raptors and we’ve over 1000 boxes in total! Many of these boxes have been monitored for 30 years. This year, we’ve only found 11 Little Owls pairs breeding in our boxes. 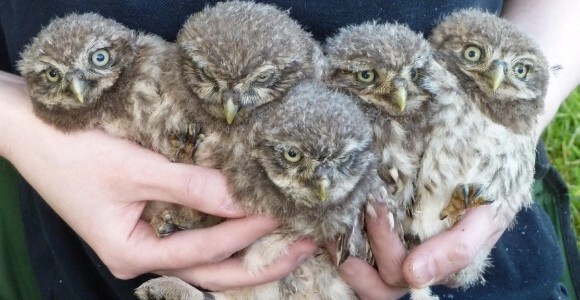 We used to have more than 20 nesting pairs but Little Owls have declined over the past decade. In 2016, our Little Owl first egg dates ranged between the 4th and 22nd of April – we were surprised when we checked a box for breeding occupancy on the 10th of May to find three hatchings and two eggs! This is an earlier than average. Historical national Little Owl first egg dates range between the 11th of April and 8th of May – median date is the 23rd of April. We’ll shortly be rechecking these boxes and will ring adult and juvenile Little Owls in June. Later on this Spring, we’ll provide you with breeding season update from our project, and other fantastic Little Owl nest box projects found in Cheshire (Roy Leigh), Gloucestershire (GRMG), Lancashire (Bob Danson), Lincolnshire (Bob Sheppard & Alan Ball) and Oxfordshire (Vincent & Gary Cartwright). You can read our regional round-up of the 2015 Little Owl breeding season from five nest box projects here. And finally, we’d love more of you to monitor and submit your nest records to the BTO. Find out more about their Nest Record Scheme here and please get in touch if you’d like advice on Little Owls!